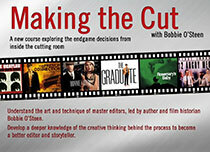 When it comes to thinking about and discussing the craft of editing, Bobbie O’Steen is one of the most articulate and incisive people I have come across. She has a way of getting below the surface and helping us all understand what actually makes a scene or sequence fly. She is undoubtedly a great lover of the cinematic arts. Bobbie is the best there is, bringing to light the art of editing, the importance of editing, and actually helping people understand what it entails and what an essential component of the filmmaking process it is. – Jamey DuVall, producer and host of Movie Geeks United! Author O’Steen’s one-on-one sessions continue to be one of the highlights of EditFest on both coasts. The Invisible Cut gets inside the editor’s head more than anything I’ve ever read. O’Steen provides a fascinating window into the editiorial process through the use of frame grabs and film analysis… The Invisible Cut will be enlightening to filmmakers or anyone who loves the art of film. With this meticulous book, Bobbie O’Steen has dissected the fine art of cinema’s surgeons and created an invaluable guide for anyone seriously interested in the mysteries of film. This book is a terrific demystification of a poorly understood art. Without burying the reader in ‘geek’ or ‘tech’ talk, Bobbie O’Steen, drawing on a distinguished editing heritage, introduces us to no-nonsense easy-to-comprehend principles of the mysterious art of editing. I wish I’d had Bobbie’s book when first starting out. It would have saved me a lot of time and trouble. This is the first book about editing that demystifies the process: that clarifies precisely what a film editor does with film, how he does it, and why. All this, using as examples some of the best films ever made. I wish The Invisible Cut had been available to me when I made my first cuts as an editor. It would have guided my choices, reinforcing them with purpose and focus. With personal accounts from editors who made the cut, accompanied by perfect frame grabs, O’Steen’s book explain an intuitive and abstract art that is the film editor’s craft. The Invisible Cut is an impressive book. Bobbie O’Steen has a unique perspective and an uncanny insight into the complicated mind of the editor. I found that a bit unnerving, as if she could read my thoughts when I wake up at 4 a.m. obsessing about a sequence I’m grappling with. I found her book very educational and entertaining. The Invisible Cut is the essential book of editing for students and professionals alike. Its use of frame clips brings to life what other authors only write about. O’Steen has created one of the truest books about film editing ever written. I wish I’d had this book when I began my editing career. It should be mandatory reading for all film schools. Bobbie O’Steen’s experience in the field of editing, and her obvious comfort and delight in talking about it with editors and directors, make this a fascinating work for anyone interested in how movies are put together. Using examples from a series of feature films with a variety of editorial styles, she makes a compelling case for the importance of a detailed analysis of editing in the creation and study of films. 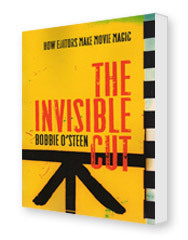 For anyone who wants to learn and understand the process and significance of editing, The Invisible Cut is the book to read and own. The blend of tutorial and aesthetic is perfect.